Although it was not the first Science Fiction roleplaying game—that distinction would fall to Flying Buffalo Incorporated’s Starfaring, published in 1976—Traveller was the first popular Science Fiction roleplaying game. Published in 1977 by Games Designers’ Workshop, it began life as a set of generic rules which could be used to run a science fiction game. These rules would go on to exhibit a number of key features influenced by the Imperial Science Fiction of Poul Anderson, Isaac Asimov, Andre Norton, H. Beam Piper, EC Tubb et al of the 1950s. These features are a focus on human characters, though with capacity for alien species; Faster-Than-Light travel via ‘jump space’ of limited number of light years per jump, but with the same duration per jump; no Faster-Than-Light communication—the speed of communication is limited by the time taken by each jump; no Prime Directive—planets conduct internal wars, whilst capitalism is engaged in on every level; a stratified, almost feudal society, with the nobility—from baron, marquis, and viscount to count, duke, and archduke all the way up to emperor—governing continents, planets, star systems, sub-sectors, and sectors; materialism in that rewards are physical and social rather than mechanical, so no Experience Points, Leveling Up, and so on; an array of options in terms of career, ship, and subsector design to create diversity; and mortality—characters are normal and skilled rather than superpowered, and can die even with the huge advancements made in medical science, even during character generation. For Traveller, these would find expression in The Third Imperium, perhaps the greatest of the Science Fiction settings for any roleplaying game, which projects a future history across millennia and thousands upon thousands of systems and worlds, involving true heroes and villains, hundreds of sophonts—both major and minor, and deep, interesting secrets. 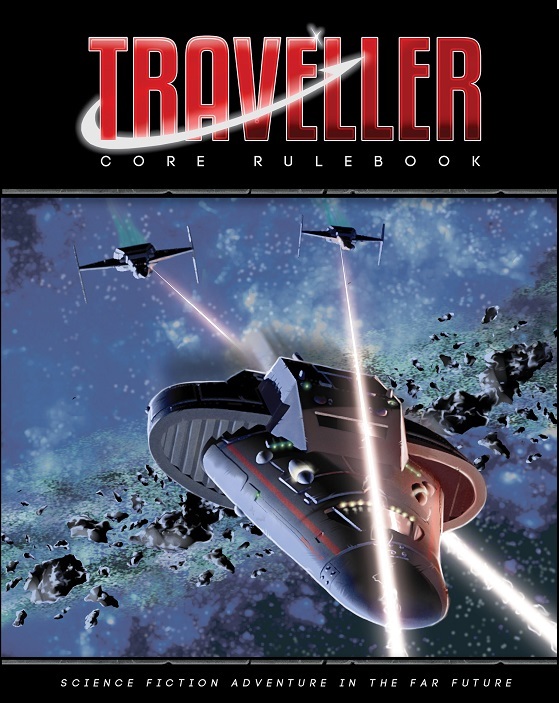 In the four decades since its original publication as ‘Little Black Books’, Traveller has appeared in numerous versions from various publishers, including Traveller, MegaTraveller, and Traveller: The New Era from Game Designers’ Workshop, T4: Marc Miller's Traveller from Imperium Games, GURPS Traveller and GURPS Traveller: Interstellar Wars from Steve Jackson Games, Traveller D20 from QuikLink Interactive, and Traveller Hero from ComStar Games. In its fortieth year, Traveller is published by two companies. Traveller 5 is published by Far Future Enterprises, whilst Traveller, now in its second edition, is published by Mongoose Publishing. First published in 2008, what is so amazing about the second edition of Mongoose Publishing’s Traveller: Science Fiction Adventure in the Far Future is that the core rulebook is in full colour throughout. This includes the artwork, some of which is good, but quite a lot of which is awful. What is also amazing is that the layout is clean and tidy. What is really amazing is that the editing is of a professional standard. In other words, the Traveller: Science Fiction Adventure in the Far Future core rule-book is a product that looks and feels professionally done—barring some of the art-work—which is not something that could always be said of previous books from Mongoose Publishing, especially those released for Traveller. It is important to note what the Traveller core rulebook is not and that is, a complete toolkit for creating and running a science fiction campaign. If a Game Master wants a complete toolkit for his Traveller game, then Traveller 5 is perhaps a better choice. 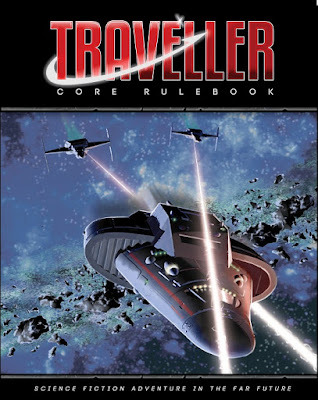 What the Traveller core rulebook does include is rules for character generation and combat, operating vehicles, spaceships, and starships in and out of combat, trade, psionics, and world creation, but it does not include rules for creating or designing spaceships and starships. This is covered in the High Guard supplement. Instead, details are given—including deck plans—of some nineteen starships and smallcraft plus variants common to the ‘Official Traveller Universe’ of The Third Imperium. What this means is that long time devotees of Traveller and The Third Imperium could switch to these rules and continue playing without any problem. It also means that the Game Master could create a Traveller-like setting and run a game in that setting, but the technical aspects of his setting would still be those of Traveller rather than those of his design. The starting point in a great many roleplaying games are neophyte characters, barely teenagers, armed, armoured, and possessing just enough skill-at-arms, magical knowhow, divine grace, and slippery stealthiness to get into trouble. Traveller changed that by introducing a form of lifepath to create a character and his back-ground. Characters in Traveller instead spent years in a career, learning skills, gaining promotions, and so on, before leaving the service with a bonus, perhaps a pension, and either possession of, or shares in, a starship. Notoriously, there was always the possibility of a character dying during the character generation process. This still forms the basis of character generation in Traveller, but with several differences, one of which is that characters no longer die during the creation process, though they can be wounded. Characters are defined by six characteristics—Strength, Dexterity, Endurance, Intellect, Education, and Social Standing—each rolled on two six-sided dice and expressed as line of numbers and letters called UPP or Universal Personality Profile. After acquiring some base skills at level zero, a character can attempt higher education—either university or a military academy before entering a service. Five of the original six that appeared in the Little Black Books—Army, Marines, Merchant, Navy, and Scout—are joined by a further seven—Agent, Citizen, Drifter, Entertainer, Nobility, Rogue, and Scholar—representing the sixth of the original careers, Other. Two further careers, Psionicist and Prisoner, are also available, depending upon the results of certain dice rolls during the character creation process. Each career provides three branches or variations. So for example, the Navy career lists the Line/Crew, Engineer/Gunner, and Flight assignments, the Entertainer career lists Artist, Journalist, and Performer assignments, and the Drifter career lists the Barbarian, Wanderer, and Scavenger assignments, and so on. A character can change assignments within a career, this is easy within a service like the Navy or Scouts, but is treated like changing careers for some like the Merchants and Citizens. From one term to the next, events are also rolled for the character. Tables for both events and mishaps are given for each career and there is also a table of life events. These add colour and detail to a character’s background and can grant benefits as well as penalties. Players can also link their characters by sharing an event and are encouraged to do so by being granted an extra skill each. At the end of the process, a character receives benefits ranging from money, characteristic increases, weapons, and equipment to contacts, ship’s shares and mortgages, and actual ships, all depending upon the career. The last two steps in the character generation process are rolling for aging and taking a skills package. Aging is inevitable and will eventually result in the reduction of a character’s characteristics, and though it can be forestalled with the use of anagathics, this is hazardous to the health, expensive, and potentially illegal. The skills package is selected as a group, each package representing the type of game that a group wants to play. So there is a general Traveller skill package, a Mercenary skills package, a Trader skills package, and so on. What it means is that between them, the characters in a campaign will have the right skills. The default species for characters in Traveller is Human, but it also offers two other options from the Third Imperium setting. These are the leonine Aslan and wolf-like Vargr. These are the most accessible of the alien species from the Third Imperium setting and their inclusion comes with just about enough information to play them. Their inclusion does not add any further complication to the process of character generation, but character generation is relatively complex anyway and takes a bit of time and a lot of dice rolls, so it is essentially all random. It is also made longer by needing to be a social process in order to form the social connections. The sample character failed to get into university and so instead decided to see the galaxy by signing on with a free trader. Originally learning to handle and trade cargo, she become a pilot and navigator before war broke out between two minor states outside the border of the Third Imperium and the Third Imperium stepped in to enforce a peace. Driven to trade beyond the war zone, the free trader’s fortunes took a turn for the worse and she and her crew were forced to turn to piracy. Overall, characters in Mongoose Traveller look pretty much like those of previous editions. Notably, there is a slimming down of both the number of skills in the game and the skill points a character can gain during the creation process. The former is achieved by subsuming a lot of the skills in previous editions of the roleplaying game into specialities, so that Computers is part of the Electronics skill along with Comms, Sensor Ops, and Remote Ops, and Battledress is part of the Vacc Suit skill. The latter is achieved by it being possible to have a level of zero in a skill and the upper value of any skill rarely needing to be above two or three. This is offset by bonuses granted by a character’s attributes. The core mechanic in Traveller remains effectively the same as in the previous editions. To have a character attempt an action, a player rolls two six-sided dice, aiming to roll a set Task Difficulty or higher. An average Task Difficulty is eight or higher, but can drop as low as two and rise as high as fourteen. Modifiers for a roll can come from a character’s attributes and skills. In addition, a character can gain a boon or a bane die to add to the roll, depending upon the circumstances. So, a boon might come from a good set of tools, whilst a bane might come from an inferior set of tools. A boon or a bane die adds a third die to the two rolled for an action, but only two are counted. In the case of a boon die, the highest two are counted, whereas a bane die means that the lowest two are counted. So, for example, Anged Jonett’s ‘merchant’ ship is ambushed by Vargr pirates and it suffers a hit that causes the bridge to suffer decompression. She and her fellow bridge crew need to suit up as fast as possible. Anged is not in her spacesuit, but since she captains a ship that is involved in situations where combat might ensue, she ensures that vacc suits are kept at duty stations. The Game Master sets the Task Difficulty at Average or eight. Anged’s player will roll two dice and two for Anged’s Vacc Suit skill and two for her Dexterity. Anged’s player suggests that since Anged has run drills for this, she should have a boon die. The Game Master agrees. Anged’s player rolls 3, 5, and 6. The boon die means that she keeps the best two, which are the 5 and the 6. With the addition of the modifiers, Anged’s player rolls a total of fifteen and succeeds. Sometimes, it is not enough to succeed, but necessary to know how well. The difference between the Task Difficulty and the number rolled gives an Effect value which measures how well a character has succeeded or failed. Using this Effect Value, it is possible to actually fail the roll with a marginal failure which can be turned into a success with consequences. An Effect value of six or more below the Task Difficulty results in an ‘Exceptional Failure’, whilst an Effect value of six or more above the Task Difficulty results in an ‘Exceptional Success’. Continuing the previous example, the Effect Value would be seven, the equivalent of an Exceptional Success, which the Game Master rules that Anged manages to suit up without any difficulty and also manages to help her crew suit up without any difficulties so that can respond to the attack unhindered! Notably the Effect value is added to damage inflicted in combat, the rules for which are explained in just a few pages, much like the rules for skills. In fact, the rules for personal combat are simple and straightforward with a concise set of modifiers so as not to hamper play. This being Traveller, it should be noted that any damage suffered is deducted from a nebulous set of Hit Points, but directly from a character’s physical attributes, first Endurance, then Dexterity, then Strength. Players should be aware though, that weapons, especially guns—slugthrowers, energy weapons, and heavy weapons—can be very deadly. An autopistol will inflict up to fifteen points of damage, a laser rifle up to thirty points, and a Plasma Gun, Man Portable—which is particularly deadly—as much as sixty points! Put that in the context of an average human having attribute values of seven each and it is easy to see how deadly weapons are in Traveller. Armour is therefore vital equipment. Equipment in Traveller is presented like a catalogue as much as it is a set of mechanics. So not just an indication of average standards of living per Social Standing, but also armour, communication gear, computers and software, medical gear, sensors, survival gear, and of course, weapons. All of the items are illustrated to give some idea what they look like in The Third Imperium. In comparison to previous editions of Traveller, the equipment here is not so obviously dated. In particular, the computer technology of Traveller was always stuck in the period of the 1960s and 1970s, but here it has been updated to reflect what contemporary computers are like. To that can be added rules and devices for personal augmentation or augments. So characters can improve themselves with Cognitive, Dexterity, Endurance, or Strength Augmentations, improve their senses with Enhanced Vision, armour themselves with Subdermal Armour, and gain access to improved or other skills with Wafer Jacks. This reflects a change in the Imperial Science Fiction of Traveller to the Cyberpunk fiction of the 1980s, but their inclusion will not necessarily overpower a Traveller game as they are expensive to purchase. So, in a Traveller-style game, player characters with extensive cybernetic augmentation are likely to be rare. Combat in Traveller scales up to encompass vehicle combat and space combat. Much like the rules for skills and personal combat, these opt for a certain concision. So in just eight pages, rules are presented for movement, combat, maneuvering, vehicle weapons and equipment, damage, repair, and collisions. These are supported with seven sample vehicles, from ground cars to G-Carriers and Grav Bikes. What is clear from the rules is that are they are designed for small engagements, rarely more than one-on-one, rather than mass battles. The aim here is personal, or rather, character involvement and roleplaying rather than simulation. This is more explicit in the explanations of spacecraft operations and spacecraft combat, where Traveller has a number of specific skills that needed to successfully operate a spaceship. In combat, though, a character will have a very specific role, depending on his skills. So a Captain will make rolls on Leadership and Tactics (Naval), an Engineer might prepare the Jump Drive or repair a system, a Sensor Operator will engage in electronic warfare or try and gain a sensor lock, a gunner will fire weapons or reload, a Pilot will evade or maneuver for advantage, a marine will conduct or repel boarding actions, and so on. Just as the chapter on vehicle combat is supported by a selection of sample vehicles, the chapters on spaceship operations and spaceship combat are supported by some nineteen starships and smallcraft plus variants common to the ‘Official Traveller Universe’ of The Third Imperium. These all come with full colour deck plans, though in the larger ships these are a little difficult to read. They range from the one-hundred-ton Scout/Courier and two-hundred-ton Far Trader—both staples of a Traveller campaign—up to the six-hundred-ton Subsidised Liner and the eight-hundred-ton Mercenary Cruiser. The selection enables the Game Master to run a variety of campaign types, a tramp freighter type campaign could be built around the Scout/Courier or Far Trader; a mercenary campaign around a Mercenary Cruiser; a Yacht or Safari Ship for a more leisurely style of campaign, and so on. More setting rules cover encounters with animals and NPCs, some encounter tables, trade between star systems—which supports merchant campaigns in particular, and the creation of the setting itself and worlds. The latter focus on the creation of single worlds rather than actual systems and their stats can be expressed just like the UPP as a Universal World Profile. The process is quicker and simpler than the creation of player characters and the process includes some cultural differences to differentiate between other worlds. Our sample world is Clora 63, a small, low-g (0.25 G) water world with a diameter of 4,800 km, standard atmosphere which is home to roughly seven million inhabitants. It is an icy world with extensive ice caps and little standing water. A rich, non-industrial world, it is a retreat world governed from neighbouring Foastea which makes its money catering to all year-round winter sports. Although they are outlawed in the setting of the Third Imperium, Traveller includes the rules for psionic abilities. These are organised into five Talents—Awareness, Clairvoyance, Telekinesis, Telepathy, and Teleportation—under which there are activities a psion can use. So, Telepathy includes Life Detection, Mind Link, Telempathy, Read Surface Thoughts, and so on. Each Talent is treated like a skill and each activity a skill check, much in line with the Task Difficulty mechanics. The core modifiers to any roll will be a character’s modifier from his PSI stat and the level of the Talent it-self. Although Psionics can be powerful, what limits their use is the number of points of psionic power a character has to use and by their use being illegal in the default setting. Plus, gaining access to the Psion career requires certain Life Events to be rolled for during character generation, the same as the Prisoner career. Ultimately, whether or not psionics play a role in a campaign is up to the Game Master to decide, but if allowed, the Psion career is not one that can be freely chosen. Our second example character is a corporate manager and leader whose long-term career was hampered by his poor social standing. Instead he took a sabbatical to join a secret psionic study institute he had been in contact with since his days at university. Unfortunately, the institute was unmasked and he was forced to go on the run before being captured and imprisoned for crimes against the Imperium. Rounding out the Traveller rulebook is a description of a complete subsector. This is the Sindal subsector in the Trojan Reach located between the Third Imperium and the Aslan Hierate. Just seventeen worlds are described in a mostly empty subsector of space, each with a patron who might hire a player character group. It contains a good mix of worlds and is decidedly rough and ready section of space where the player characters can act with impunity. As pleasing as the relative simplicity and concision of the rules in Traveller are, they are lacking in two ways. One is the lack of reference or flow charts, both of which would have been helpful for running combat at all levels—personal, vehicular, or space—of the roleplaying game. There is one for character generation, but nothing else. The other is a lack of examples. There are examples in the book and they are useful, but there are no extended examples. So, no example of play, of combat, of vehicle combat, or spaceship combat. Which is such a shame and such a missed opportunity, as they would have helped bring the game come to life and the rules easier to understand through seeing them in action. At the start of the review, I stated how much of a revelation the corebook rulebook for Traveller: Science Fiction Adventure in the Far Future was and that remains true. As physically decent as the book is, what strikes you about this version of Traveller is the efficiency and concision with which the rules are presented and written. This in turn makes them accessible and easy to understand—especially for anyone already familiar with Traveller—though the lack of worked examples may hinder players new to the game and the setting. Above all, the Traveller Core Rulebook is a competent, accessible set of rules for playing in the Third Imperium and playing Imperial Science Fiction.